Hop, hop, hopping down the bunny trail our adorable bunny rabbit has a basket full of eggs he’s ready to deliver. Kids will flip over finished soaps made from these molds. A real must for everyone’s Easter basket! Size(inch): 3 1/3 * 2 1/2" * 1 1/3" Size(cm): 8.4 * 6.4 * 3.3 MP Soap: 5.80 oz. per bar (162 grams) CP soap: 5.35 oz. per bar (150 grams) Packing: cardboard box / per pc cavity: one cavity per mold Please note: The photo shows a finished soap made with the silicone mold described above. 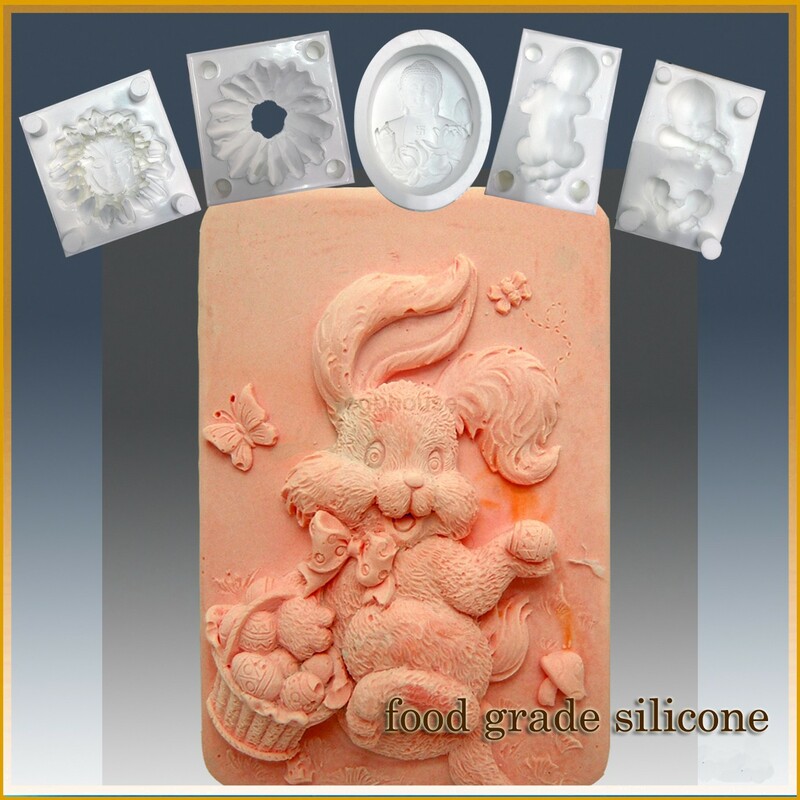 You can use it to make Chocolate, fondant, candy, marzipan, polymer clay, sugar paste, icing, cold porcelain, soap, candle, etc.. (On top of the picture showing examples of our food grade molds. They might not include the design we are selling here. Just wanting to let you know what our mold looks like.) Note 1: Our food grade silicone molds are generally in white as shown in the picture. Sometimes it will be orange color or blue color silicone. We are having 3 US suppliers. Note 2: This silicone mold can be used for soap/candle craft and/or food crafts. But, we do not suggest you to use a same mold for food making and non-food making.